Synopsis: Valve has just released their sequel to the critically acclaimed action horror shooter, Left 4 Dead, right around a year from the release of the original title. While we were lucky enough to receive a copy from Valve for review purposes, it was my pleasure to get some hands on time to review the fast paced coop extravaganza. 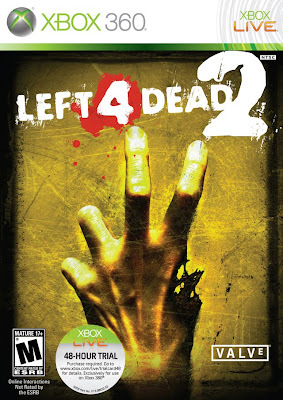 Though many Xbox owners have played or heard of Left 4 Dead, the sequel boasts new episodes, weapons, infected types, gameplay modes, and survivors. The AI Director has also been improved to 2.0 for this entry, changing the weather, size of zombie hordes, effects, and sounds, based on the party performance. Players are taken through 5 new campaigns drudging through swamps, cemeteries, amusement parks, malls, motels, and more places that seem fitting to decimate zombies with your diverse survivor friends. Along with more guns to choose from, melee weapons such as chainsaws, frying pans, and ninja swords are equally satisfying for zombie wetwork. Though many fans of the original are skeptical and on the fence as to whether the sequel came too soon or a should have been a DLC expansion, now that the release has come, we will see if Valve does what it is known for. 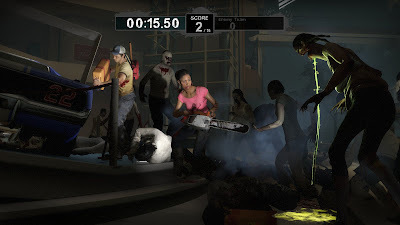 Praise: The gameplay is just as fun and addicting as the original Left 4 Dead, with great improvement across the board, staying true to what made the game work so well in the first place. 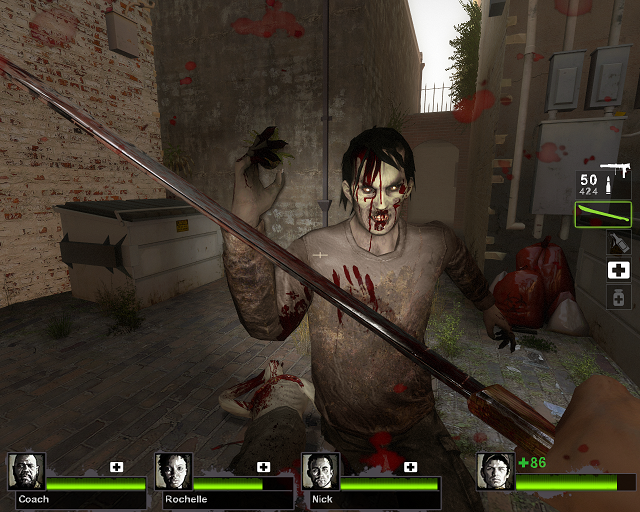 The graphics have been improved along with the variety of weapons, ammo type, and melee weapons to keep the slaughter fest fresh. Killing zombies with the melee weapons such as the chain saw or the frying pan is almost more fun to me than taking out a horde with guns blazing. Dialogue between the characters seem to give each survivor more personality and the “uncommon” common infected types, such as clowns, mudmen, or zombies in hazmat suits seem to make each campaign more unique. The AI Director 2.0 is good, I did not notice much of a difference from the original, but also did not feel that anything needed to be changed. Gripes: The first thing I noticed right of the bat in multiple campaign attempts was lag, sometimes so bad that I would have to quit and find another match. When I was able to find a match that was not lagging, other characters would experience lag during gameplay. I know that this will be resolved, but it should not be an issue with a game where online coop is the main focus. I have also spent some time with the other gameplay modes, versus, survival, and scavenge, while they all add to the variety of gameplay, they did lose their novelty quickly and had me heading straight back to the coop campaigns. Overall, I did not feel as if this title was an expansion and felt as if it were a true sequel. 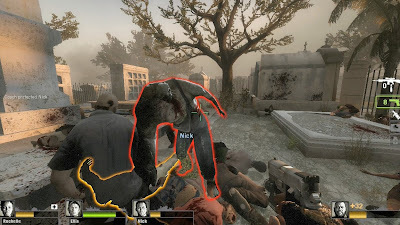 Like most other sequels out there, Left 4 Dead 2 holds true to the formula that works, while adding new features to improve and help it stand out from the original. I have to admit that I was one of the skeptical many that thought it was too soon for a sequel; Valve did exactly what they stated while still providing support and new content to the original. Once the lag is resolved this will be a near perfect zombie kill fest. 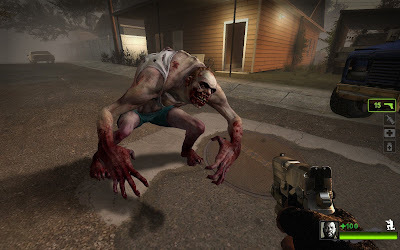 Mashbuttons.com gives Left 4 Dead 2 a 9 out of 10. Left 4 Dead 2 is available now for the PC and Xbox 360. Nice post. I haven't played any horror-flick game yet and your review just made want to try it. I hope that it'll not disappoint.